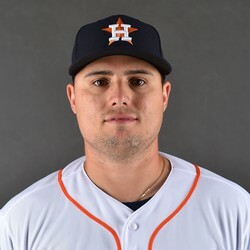 The Astros acquired Aledmys Diaz from the Blue Jays in exchange for minor league RHP Trent Thornton. Diaz could help fill the gap that's expected to be created by the exit of free agent Marwin Gonzalez. Like Gonzalez, Diaz has shown an ability to hit with some pop and play all over the diamond. It's unclear how much playing time will be available for Diaz, but he is someone to monitor this spring and even into the season as he could take on a significant role in one of the league's top offenses. Aledmys Diaz went 2-for-4 with two runs scored and a three-run home run on Wednesday against the Rays. Diaz has hit safely in three straight games and is up to 17 home runs on the season. With Josh Donaldson officially out for the season and Yangervis Solarte still injured, Diaz should continue to see regular playing time. Aledmys Diaz went 1-for-4 with a solo home run Tuesday against the Orioles. Diaz has been rather quiet offensively of late, but he continues to see regular playing time and is up to 16 homers on the season. As such, he's someone to consider as an MI in deeper leagues. He has an OPS of .254/.289/.452 on the season. Aledmys Diaz went 1-for-3 with two RBI in Friday's 7-5 loss to New York. Diaz has been seeing a full-time role with the Blue Jays infield dealing with injuries. The veteran shortstop is hitting a solid .286 with three home runs over the last 14 games and is a good pickup in deeper fantasy leagues and AL-only formats if fantasy owners need some help at shortstop.